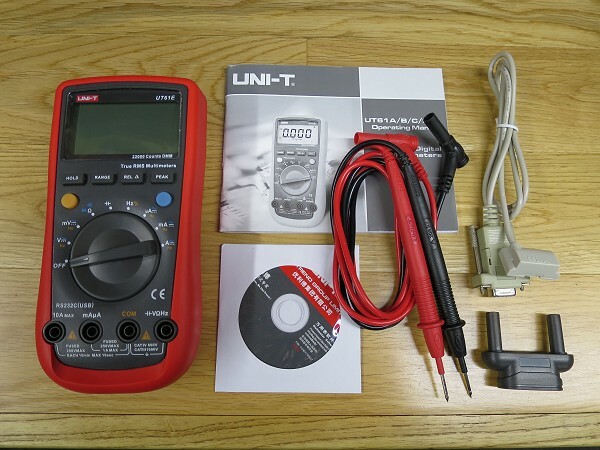 The UNI-T UT61E is the most sophisticated meter examined so far in the Budget Multimeter section. It is 22,000-count, true RMS, has a bargraph, and features a PC interface for logging readings. Other headlines include frequency and duty cycle, capacitance, and relative mode. The basic DC specification is 0.1%. It runs from a PP3 (included) and is rated to CAT III 1000V and CAT IV 600V - though as we'll see, we have good reason to be suspicious of that. The price varies, but is typically in the £40-45 region. I ordered one from Banggood.com when they were on special offer for just £31.65 delivered. It's been out for quite a while now, so there's plenty of information available elsewhere out there, but this series gave me the excuse to try one for myself. 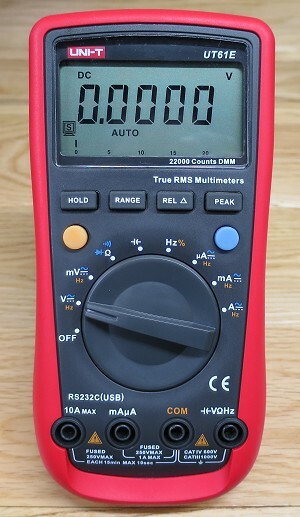 I will say at the outset that some of my previous bad experiences with cheap multimeters came from UNI-T meters (rebadged as Tenma and purchased from Farnell). We bought half a dozen, and after about 2-3 years of very light use in our electronics lab, they all started developing faults. The "best" fault was an intermittent lock up, where the display obstinately showed 0.000V, irrespective of any input that you might choose to apply. Now this could have been fatal if you'd trusted that meter to tell you if mains circuit was alive or dead - and reinforced to me the importance of constant vigilence when working with electricity. I always do the 3 step safety test: test a known-live circuit first, test the actual circuit next, and then repeat the first step to ensure your meter is still working and didn't somehow fail between steps 1 and 2. Sounds extreme, but it's easy to do, and might save your life one day! Needless to say, those meters were put beyond use, while our collection of 30 year old Fluke 75s are still working today. They might have been moderately expensive originally, but we certainly got an excellent ROI from those! Inside the colourful box is the meter, probes, RS-232 adaptor, battery, a CD-ROM and the manual. In addition is an adaptor for capacitance and seemingly transistor testing and temperature - we'll get on to that shortly. The probes are full size, and of reasonable quality. However, they are fairly stiff - falling somewhere between the BSIDE and Aneng types in that regard. They are rated at a claimed CAT IV 600V and CAT III 1000V, and 20 amps. Unusually, there are no separate tip covers, so those CAT ratings apply at all times. 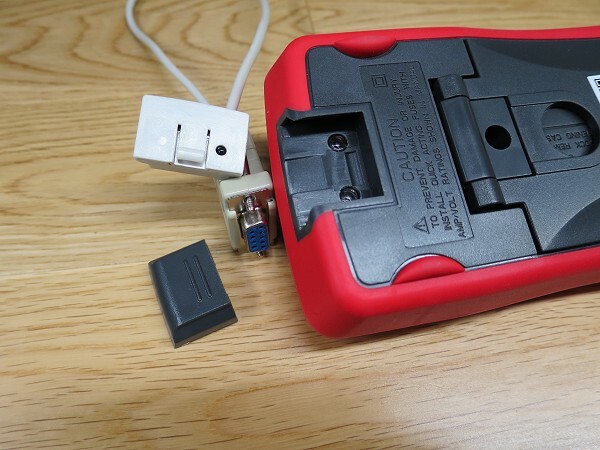 Here's a closer look at that adaptor, which plugs into the positive and mA/µA input jacks. As mentioned, this is for capacitance readings, but also has connections for transistors and a thermocouple. But this model doesn't support hFE measurements or temperature - which is confusing at first glance. From a look at the manual, it turns out that only the UT61A does hFE, and temperature is only present on the UT61B and UT61C models. Still, if you must offer a hFE function, this is a much safer way of providing it than the usual socket on the front of the meter itself. The meter feels solid enough, and is covered with a bright red soft-touch overmould - I rather like the colour. The tilting bale is wide and positive in action, and does a good job of steadying the meter against button presses and rotation of the range switch on all but the most slippery of surfaces. But the range switch is a bit vague in action and requires too much force to turn, and the buttons are also rather stiff for my liking. This meter is pretty intuitive to use, though I don't like the use of the coloured buttons. The yellow one only ever does Hz (and duty cycle), so why not simply label it as such? That would have saved putting the small yellow print around the range switch, making that less cluttered - the subsidiary print on the range switch is actually less clear than that of the much smaller AN8002/8 meters. The blue button is like the Select button on the Aneng meters, switching between DC and AC on voltage and current ranges, and switching between Ohms, continuity and diode test. The LCD is good, with excellent contrast and viewing angles. The digits are quite a bit smaller than the tiny AN8002/8 meters, but that's in-part because of the addition of a bargraph - the only meter in the budget section to include one. However, somewhat surprisingly, this meter has no backlight. Yet the UT61A, UT61B, UT61C and UT61D all do. This is one confusing product range! The best available resolution is 10µV, 10nA, 10mΩ, 1pF and 0.01Hz (not the 0.001Hz the manual claims). Like the meters from Aneng, in mV mode, the meter presents a very high input impedance - I gave up trying to measure it, but it's definitely well into the GΩ region. The DC voltage accuracy is spot-on, and current seems pretty good too. If you exceed the maximum current for the function, the meter beeps at you. So this is rather strange - note the 5kHz result, where it fails to meet the spec. We see a distinct rise after 10kHz, peaking at 150kHz before falling away again (150kHz was the peak). Meters that give rising results are relatively rare in my experience - the BSIDE ADM01 and BSIDE ADM02 are the only others I've seen that do that. Ultimately, we can only trust the meter to the 10kHz given in the specification. Well, on the 2.2V range, at least. Something that leapt out at me during those tests is just how painfully slow this meter is. I'd estimate that it's about 2 readings per second, give or take. Much slower than the Fluke 187 and Aneng AN8008 that were sat next to it. The bargraph helps a lot, but even so, this is a bit of a problem. Auto-ranging is relatively swift, luckily, and the meter settles quickly, with no more than 1 or 2 intermediate results before displaying the final result. While occasionally some of those incorrect numbers might be a little higher than the ultimate reading, there's no sign of false range-changing as a result of overshoot, unlike the BSIDE ADM01/2 and RS 14 meters. The diode range gives around 2.8V, which is enough to light a white LED dimly (the test current is about 1.7mA), but the meter only gives a voltage reading up to 1.9V (although the bargraph goes higher). At less than about 0.2V, the buzzer sounds. The continuity mode is not the best - it doesn't seem to be latched, and the response time is quite slow. The threshold is around 20Ω. Checking the frequency counter, this one doesn't absolutely require the signal to cross 0V, but it has a limited range either side of this where it works. With a 0.5VRMS sine wave, it read fine until the DC offset reached 10V. It initially appeared to be free of any AC+DC bugs until the DC offset reached 8.8V, and then the auto-ranging was horribly confused, leaving the meter oscilating on AC and refusing to settle on a range and give a reading. This meter has a "soft" AC/DC switch, so it's more likely to suffer from this issue, as discussed here. In fairness, this meter is not the worst in this regard. In fact, just DC is enough to confuse this meter when in AC mode. Anything greater than about 8V sets it off - it just sits there trying to autorange. So if you need to measure AC signals in a circuit with DC offsets - such as an audio power amplifier - you'll need to supply an external capacitor to block the DC (10nF ought to be OK). Alternatively, use a 'scope! Back to the frequency counter, the range is pretty wide - I got to 92MHz before it gave up, but the spec implies it should reach 220MHz (or at least, there is a 220MHz range). It's possible that it would have gone higher if I could have gone beyond the +17dBm (about 1.6VRMS) limit of my RF generator. In terms of sensitivity, it's about 120mV at low frequencies (<175kHz). At 1MHz, it's roughly 160mV, 220mV at 10Mhz, and 250mV at 40MHz. That's considerably better than the spec (given as <300mV up to 10Mhz and <400mV up to 40MHz). If you switch to the voltage function and select Hz, the LF sensitivity is more like 50mV, but it falls away sharply at HF, with 1MHz needing 400mV, and nothing doing at all above about 1.3MHz. There is a hold function, which is the simple type. When on hold, the bargraph continues to update (the range is held). I did discover that if you hold the Hold button for 2 seconds, the "hold" icon flashes in the display, but the meter continues to work. After 5 or so seconds of this, then the meter holds the reading and stops flashing the icon. I'm not sure how useful this delayed hold might me, and it's interesting that no mention is made of this in the manual. The relative mode is useful, but I noted that the PC software (see below) continues to record the actual reading rather than the relative reading. Not a problem providing you're aware of it. The peak mode is a bit confusing, as the first time you press the button the display says "CAL" for 2 seconds, and then displays a couple of random numbers before starting to work. The range is held and the bargraph continues to update, while the display shows the highest number recorded (and the "Pmax" annunciator). Pressing the Peak button again changes it to "Pin", to show the lowest value captured while in peak mode. Having used the mode once, it won't go through the cal stage until you re-power the meter, but it still displays 2 numbers before starting to work - the first of which is always -28000 for whatever reason. When connected to a PC, I noted that when in this mode, it switches between 2 readings that are similar to, but not the same as the min and max values, which is very confusing! In millivolt mode, the 250mV from my DVM reference was too much for the 220.00mV range - fair enough! But if you press the Peak button in the mV range, it does display 250.00mV. Does that mean the ADC has some headroom built in? As 214 is 16,385 and 215 is 32,768, it's likely that it has; which begs the question: why not go to 32,000-counts? Alternatively, it could be 14 bits with oversampling and averaging to get the additional resolution, which might explain the slow update speed. It's a shame it can't be switched to a lower count, as most meters speed up when doing so, and that would be very welcome here. Current consumption from the PP3 varies between 1.3mA and 2.5mA approximately. It's hard to measure with a DMM because of the bursts of current taken by the PC interface LED - out of interest I connected a 'scope across the ammeter to observe the pulses, which crop up with every reading every half-second or so, lasting about 6ms (I used an analogue 'scope, so make no claims about the accuracy of that!). Shorting the probes in Ohms takes the consumption up to about 4mA, and sounding the buzzer in continuity results in 5.6mA in total. The low-battery indication comes on at 5.4V, and the meter continues to work until it reaches 1.65V, continuing to display 1.0000V from my DVM reference until that point. For a 9V meter this is quite astonishing, and you have wonder why it doesn't run from a pair of AAs instead. Perhaps more extensive testing would reveal a mode that does require a higher voltage. Logically enough, the meter does not auto-power down as long as it has the "PC send data" icon lit up at the bottom-right of the screen - the trouble is, I haven't yet worked out how to disable it! I don't believe it can be disabled on the E model. 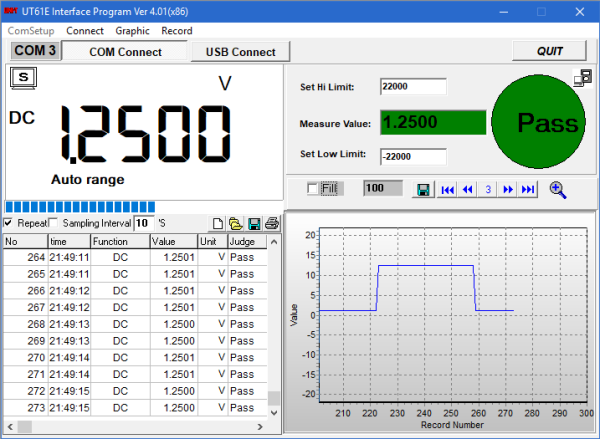 If you don't have an RS-232 port on your PC, you'll need a USB to RS-232 adaptor. I've heard reports that it doesn't work with these, but I didn't have a problem with the generic USB to RS-232 adaptor I have (apparently it uses a chipset made by Prolific, for what that's worth). I tested it on a W10 machine (32 bit). The software is pretty basic. Essentially, the dialogue is split into quarters. The top left quarter mirrors the meter's display - and to do that, it installs a few UNI-T fonts on your machine that might be handy for other things! The top right quarter of the screen is for simple go/no go testing (enter the limits as required). The bottom left section is for logging, and it fills up at the reading rate of the meter (although you can slow it down using the "Sampling Interval" option). Note the "Judge" column, which is the result from the go/no go testing. You have the option of saving the data as Excel, XML or plain text (tab-deliminated). Finally, the bottom right corner shows a graph. Clicking on the magnifying glass icon makes the graph fill the whole dialogue. For the cost, it's fine, and I could see this being useful occasionally. Of course, the meter itself doesn't have any internal memory, so you can't log without being connected to the PC, but this is not a problem in a typical workshop environment. The Fluke 180/280 models that do logging store their records internally, so you can upload them after the event (or view them on the meter itself), so are a bit more flexible, but remember that Fluke charge £200 for the software and lead to do this! For a demonstration of the software, see Martin Lorton's review. This is just one of several videos that he's made about this meter, but note that his meter is an older version, and there are differences in the PCB that are clear to see. He discusses an overshoot issue on DC which I've yet to notice to anything like that extent with my sample, happily. Mine is also a lot more accurate than his. If they've improved the design and/or QC in the intervening years, that's good news! I noted that Martin was using the same version of the software that came with my meter (V4.01), and given that he made that video in 2012, it's obviously quite old now. There are various 3rd-party options for this meter. Martin mentions UltraDMM, which works really well, but unfortunately thows up "Unhandled Exception" error messages when you go to add meters or graphs. If you click "Continue" the application carries on working. I don't know if this is a W10 problem because I haven't tried it on anything else yet. Another option is sigrok. This is a complex program that does rather more than just simple DMM logging. I gave it 15 minutes before giving up, but will return to it soon. 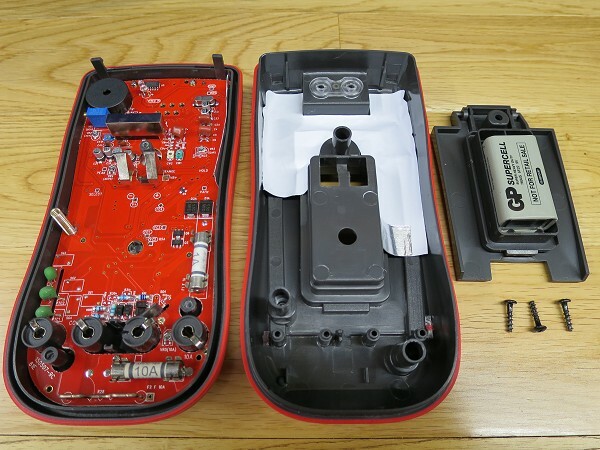 Start by removing the battery cover and the tilting bail. This is the first one we've met that has a self-tapping screw rather than a machine screw that fits in a metal insert. Be careful with this, as it will wear away with use. This screw is also helping to secure the case. As well as this one, there are another 2 to undo. As you try to separate the case, there is a pair of clips at the top end of the case that will release their grip given enough force. This is the first meter in the budget section to feature shielding! But note the same cheap input terminals that we've seen elsewhere, and basic 250V fuses, which are 25mm BS1362 types - the sort we use in mains plugs in the UK - which is a step up from the 20mm types often seen in cheaper multimeters. There are 3 PTC thermistors for protection, and some isolation slots have been cut in the PCB. To remove the PCB, undo 3 small screws and unclip the PCB from the case - which was quite tricky with my example. The LCD and its frame can stay behind. Alternatively, you can just undo the one screw by the 10A fuse and remove the PCB with the LCD still attached. There's quite a lot in this meter, and it's nice to see a real IC rather than a COB! 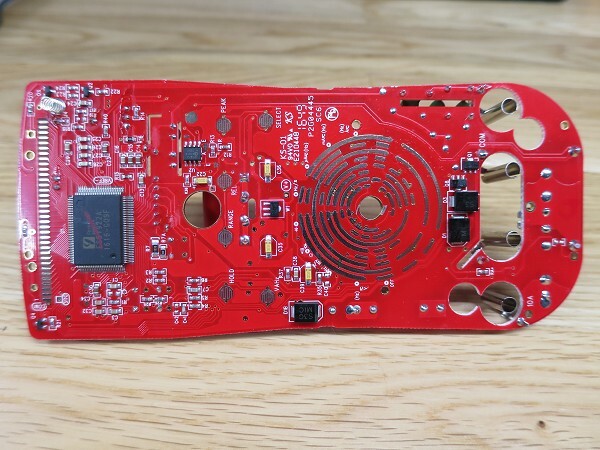 The contacts for the function switch are a bit more generously spaced than many we've seen, and some of the PCB tracks forming that switch are also well-separated. Without seeing a schematic it's impossible to be sure, but I'm hoping that they've established that spacing for the high voltage parts of the circuit. So this meter has a lot of pre-set adjustments! Including a few trimmer capacitors, implying the the HF response of the meter can be tweaked. That's good news, as it's not brilliant as it stands. Note the spaces for the spark gaps (including a second "SG4" near to the mA/µA socket!). Also note the pads on the PCB for larger HRC fuses. This meter is available in two versions - what you see here is the most widely available version, but the version sold in Germany (with GS approval has MOVs in the 4 spark gap spaces near the PTCs, and larger fuses. Also, the CAT ratings are downgraded to CAT II 600V and CAT III 300V. So what does that say about the CAT IV 600V rating of my instrument - the one with 25mm fuses and no MOVs fitted? As I said at the start, we have serious cause to doubt the ratings - as should be the case with any cheap meter - and here's the evidence! 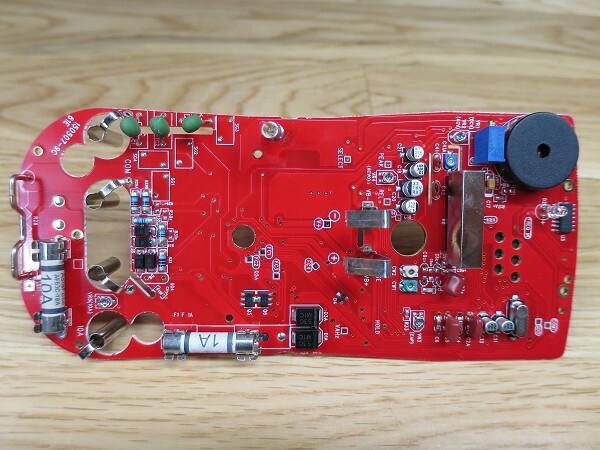 Note that my PCB is different to earlier versions (as well as Martin's videos, see this thread for examples), which have less in the way of isolation slots, and often have additional components added by hand on top of the originally installed parts. My example is actually built quite well. 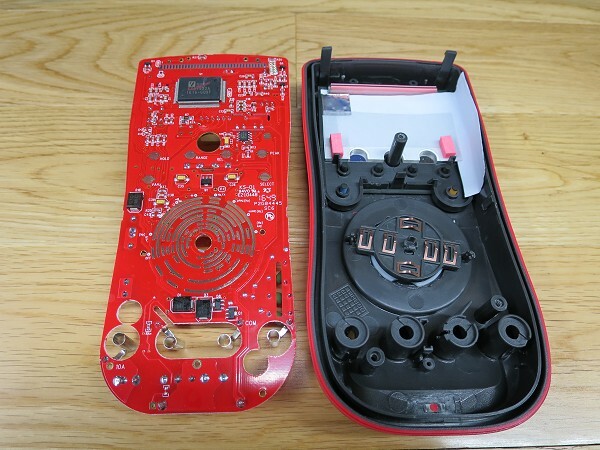 By all accounts, it seems that the PCB is the same between the world-wide and German versions today, but I've not been able to verify that - the photos I've seen of the German PCB seem to be missing the 10A trimmer (by the 10A fuse, between the input sockets), amongst other differences. There are a lot of beefy SMT diodes, which I presume are also for protection. We have a single IR LED for the PC interface, with a 4069 CMOS hex inverter next to it. Under the screen is the divider resistor network - I've not removed the screen to investigate further, but it appears to be encapsulated in plastic, so I can't tell if it's a nice thick-film network like Fluke use (as if it would be!). As with the UT210E, the crystal is 3.999MHz rather than the usual 4MHz. Under the PCB we find more diodes and some transistors near the input connectors, which are presumably for protection (I think that some of them are Zener diodes across the shunt resistors). W1 looks like it ought to be a voltage regulator, but I couldn't find any data about it. The main IC is a ES51922 from Cyrustek. The datasheet is pretty informative and well worth a look. And the 8 pin IC is an AD737J true RMS converter. Interestingly, this IC has a pretty wide frequency response (that does depend on the input level) - much wider than I measured earlier. Looking around, I note it's a moderately expensive IC - even in quantity, I'd bet that it's the most expensive component used in this meter. The cheap input sockets and demonstrably fictitious CAT ratings simply goes with the territory. That doesn't make it right - but by now everyone reading this should be aware of this - if not, please see my introduction to multimeter safety. But given my previous bad experiences with UNI-T meters, I'd really like to use the meter for a few months before drawing any firm conclusions. Would I recommend this over other meters in this section at this time? Taking size into account, I suppose the nearest competitor would be the Aneng AN860B+. That model is only 6000-count and doesn't have the PC interface or bargraph. Otherwise, it's much the same, with equally good electrical safety for half the price. Obviously, for "good", read "dubious"! The German version of the UT61E promises better safety, but it's a lot more expensive, naturally - considerably more than a Fluke 101, for example. If the 1kHz AC bandwidth of the Aneng is a problem, then the UT61E is better, but make sure you test it like I did! Really, if AC bandwidth is an issue, a nicer second-hand DMM might be the answer, or preferably, use a 'scope. 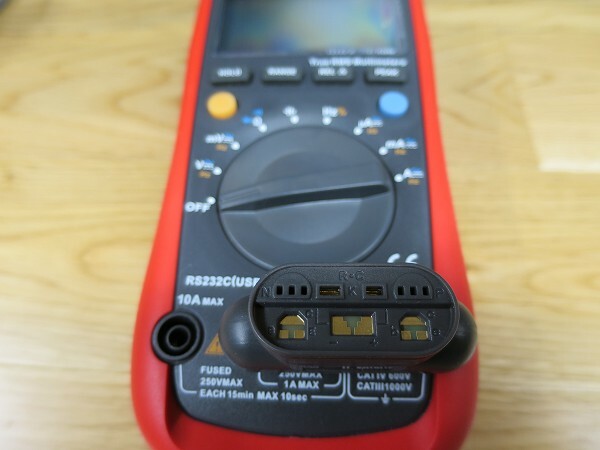 But on the bench - away from high-energy situations - if you need a cheap multimeter to do logging, this is astonishing value for money, especially at the price I paid!